Shoulder dystocia refers to a situation where, after delivery of the head, the anterior shoulder of the fetus becomes impacted on the maternal pubic symphysis, or (less commonly) the posterior shoulder becomes impacted on the sacral promontory. It is an obstetric emergency, with an incidence of approximately 0.6-0.7% in all deliveries. In this article, we shall look at the risk factors, clinical features and management of shoulder dystocia. In normal labour, the fetal head is delivered via extension out of the pelvic outlet. This is followed by restitution of the fetal head, so it lies in a neutral position in relation to its spine. This means the fetal shoulders now lie in an anterior-posterior position. Shoulder dystocia occurs when there is impaction of the anterior fetal shoulder behind the maternal pubic symphysis, or impaction of the posterior shoulder on the sacral promontory. A delay in delivery of the fetal shoulders leads to hypoxia in the fetus, proportional to the time delay to complete delivery. Applying traction on the fetal head can result in fetal brachial plexus injury, and is major cause for litigation in obstetrics. Fig 1 – The stages of normal childbirth. Shoulder dystocia commonly occurs at stage 2, where the anterior shoulder becomes impacted on the maternal pubic symphysis. Macrosomia – fetal weight above >4.5kg. However 48% happen in babies weighing <4kg. Shoulder dystocia is defined by a delay in delivery of the shoulders following the head during a vaginal delivery with the next contraction after using normal traction. Difficulty in delivery of the fetal head or chin. Failure of restitution – the fetal remains in the occipital-anterior position after delivery by extension and therefore does not ‘turn to look to the side’. ‘Turtle Neck‘ sign – the fetal head retracts slightly back into the pelvis, so that the neck is no longer visible, akin to a turtle retreated into its shell. REMEMBER – If managed appropriately the risk of permanent brachial plexus injury can be almost eliminated. Call for help – shoulder dystocia is an obstetric emergency (will need senior obstetrician, senior midwife and paediatrician in attendance). Advise the mother to stop pushing – this can worsen the impaction. Avoid downwards traction on the fetal head (increases risk of brachial plexus injury) – only use “routine” axial traction (i.e. keep the head in line with the baby’s spine), and do not apply fundal pressure (increases the risk of uterine rupture). Consider episiotomy – this will not relieve obstruction but can make access for manoeuvres easier. McRoberts manoeuvre – hyperflex maternal hips (knees to chest position) and tell the patient to stop pushing. This widens the pelvic outlet by flattening the sacral promontory and increasing the lumbosacral angle. This single manoeuvre has a success rate of about 90% and is even higher when combined with ‘suprapubic pressure’, (see below). Suprapubic pressure is applied in either a sustained or rocking fashion to apply pressure behind the anterior shoulder to disimpact it from underneath the maternal symphysis. 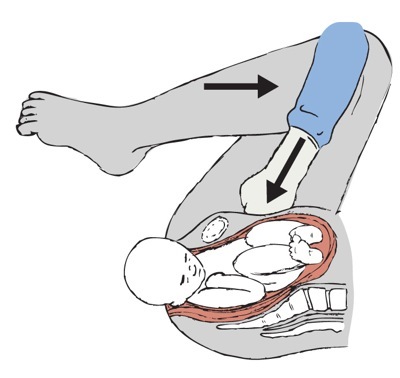 Fig 2 – The McRoberts manoeuvre – hyperflexion of the legs to increase the AP diameter of the pelvis. Posterior arm – insert hand posteriorly into sacral hollow and grasp posterior arm to deliver. Internal rotation (“corkscrew manoeuvre”) – apply pressure simultaneously in front of one shoulder and behind the other to move baby 180 degrees or into an oblique position. If the above manoeuvres fail then roll patient onto all fours and repeat (this may widen the pelvic outlet as the legs are abducted and flexed). Cleidotomy – fracturing the fetal clavicle. Symphysiotomy – cutting the pubic symphysis. Zavenelli – returning the fetal head to the pelvis for delivery of the baby via caesarean section. After delivery of the fetus, active management of the 3rd stage of labour is recommended (due to increased risk of PPH). A PR examination should be performed to exclude a 3rd degree tear. Shoulder dystocia can be a traumatic experience, particularly if the women does not have regional anaesthesia. Debrief the mother and birth partner(s), and advise them of the risk of recurrence with any subsequent delivery. Consider a physiotherapist review before discharge, as women are at increased risk of pelvic floor weakness/3rd degree tear, musculoskeletal pain and temporary nerve damage. Additionally, a paediatric review is recommended before discharge to assess for brachial plexus injury, humeral fracture or hypoxic brain injury. Maternal – 3rd or 4th degree tears (3-4%), post-partum haemorrhage (11%). Fetal – humerus or clavicle fracture, brachial plexus injury (2-16%), hypoxic brain injury. Shoulder dystocia is an obstetric emergency that can lead to lasting injury to the baby. It is usually unpredictable, but there are risk factors that make it more likely, especially having had a previous baby with a shoulder dystocia and diabetes. Prompt management in a multi-disciplinary team will lead to the best outcomes and training in skills drills is essential. The majority of shoulder dystocias are delivered by McRoberts manoeuvre. In the most common form of shoulder dystocia, what does the anterior fetal shoulder become impacted against? Which of the following is a risk factor for shoulder dystocia? What is the role of an episiotomy in the management of shoulder dystocia? Which of the following is a first-line manoeuvre in the management of shoulder dystocia? Which of the following is a fetal complication of shoulder dystocia?